Water kefir is cultured with ‘grains’ composed of over 30 strains of beneficial bacteria and a similar number of yeasts. Kids and adults alike will enjoy this fizzy probiotic drink that contains enzymes, valuable acids, vitamins, minerals and of course, probiotics! Water kefir can take on a huge range of flavours, and it makes a mean ginger beer which my wee family love. An airlock, like this Pickl-it one, will allow oxygen and excess carbon dioxide to escape easily. 2-4 Tbsp water kefir grains (to source, check out my upcoming workshops or contact me). *Care must be taken when bottling a busy carbonator like water kefir in glass, particularly during warmer weather. If you’re using a bottle with a screw top lid, I recommend not screwing it on too tightly, and releasing the lid every 12-24 hours to prevent too much pressure from building up. It’s possible to adjust jars with wire bails (such as the Fido jar pictured above) to ensure the lid doesn’t seal quite so tightly. Simply use pliers to bend the wire on both ends of the lid down slightly (for fine tuning and a visual demo, click here). The same can be done to swing top glass bottles, though please note that Grolsch bottles (pictured below) are designed for carbonated beverages. Beware of cheap swing top bottles! Dissolve sugar in water, pour into jar and add water kefir grains and raisins. A significant amount of carbon dioxide can be produced during fermentation, so it’s wise to cover the jar with a cloth if you aren’t using a Fido jar or Grolsch bottle with the wiring adjusted as described above. This will also reduce the amount of alcohol that may form in an air-tight container, though this generally doesn’t rise above 2-3% regardless. Water kefir likes a warm spot (ideally 20-25 degrees) to ferment, but it does ferment quite quickly at this temperature. Watch the raisins – when they have risen to the top, the first ferment is done. It’s important not to over-culture kefir as the grains may be damaged, and subsequently work less effectively, if they run out of food ie sugar. Strain the grains out and add them to a new jar of sugar water to begin the process again. 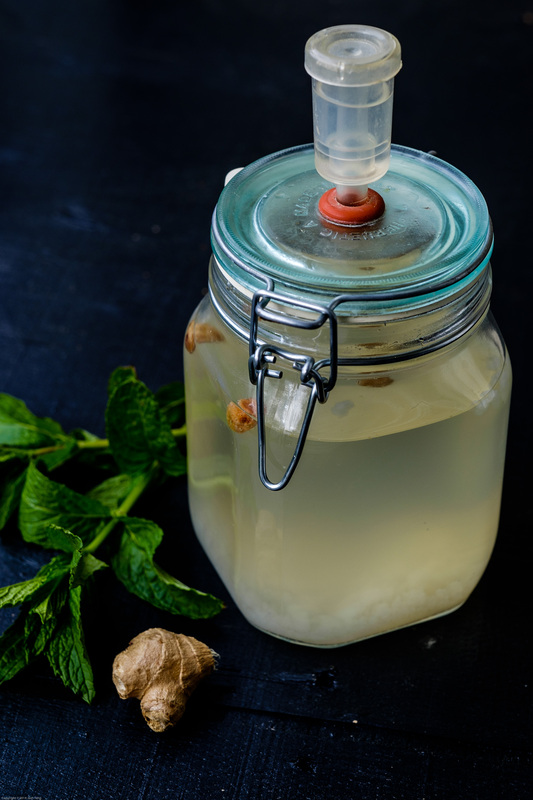 Water kefir grains can multiply quite quickly, and the more grains you have the faster the fermentation time (excess grains can be also consumed, added to a smoothie, or dehydrated for a probiotic powder. Or start sharing the probiotic love around!). Similarly to milk kefir, a second ferment will increase the vitamin B content, and continue to reduce the sugar in the water kefir. It’s also where flavourings are added and fuzziness builds up. Fruit juice, cordial, juiced or sliced ginger, fresh herbs or herbal teabags, and so on can be added. Rebottle the water kefir with your chosen flavouring additions and seal, keeping in mind that the addition of extra sugar from fresh fruits or juice will increase the speed of fermentation. Check the level of carbonation building up and taste test every 12 hours. If temperatures are cooler, the kefir may take several days to build up sufficient fizziness. Once the kefir is to your liking, transfer to the refrigerator. Best enjoyed within a week, though it will store well for a few weeks as it continues to ferment slowly. 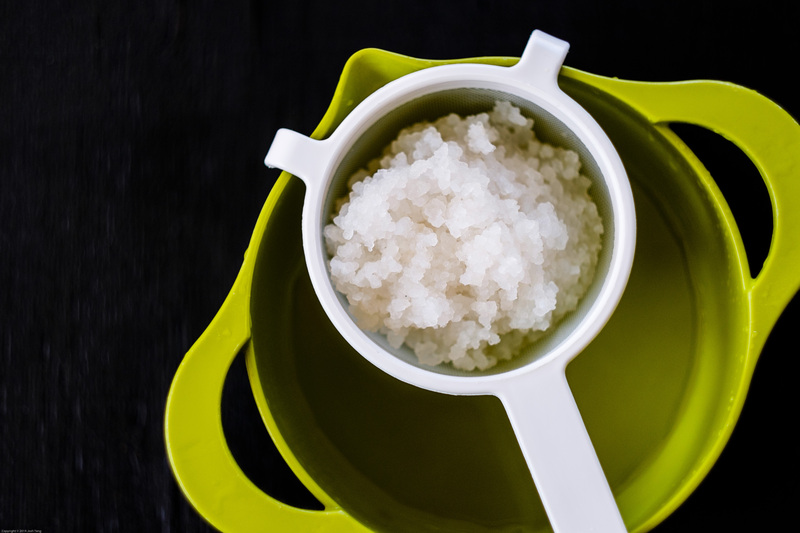 Water kefir grains aren’t quite as resilient as their cousins milk kefir grains are, and they can also be a touch snobby. They like minerals, but not too many, and they like a bit of variety too, thank you! If you have access to naturally mineralised water (such as artesian spring water) or use a less refined sugar (such as rapadura), your grains may have quite enough. Otherwise, the occasional addition of dried fruit, a few mineral drops, a teaspoon of molasses, a pinch of baking soda or sea salt, or even a sterilised egg shell will keep your grains extra happy. But don’t go overboard. If you add too many minerals, your kefir may develop an unusual thickened consistency. It is possible to use honey or coconut sugar for a period, but the grains will eventually get sad and die. The same goes for fermenting fruit juice, which can be too acidic for the grains. One way to get around this is to reserve a separate lot of grains kept healthy in sugar water. If you wish to take a break from making water kefir, simply place kefir grains in a jar, cover them with sugar water and leave them in the fridge to have a snooze. They may be stored this way for a couple of weeks or more, but transferring them to fresh sugar water weekly keeps them happiest. Kefir grains may also be frozen or dehydrated, but they are likely to be less robust later on. When starting with a live probiotic culture, it pays to build up slowly and let your body adapt. Start with a small glass, and if you suffer from digestive complaints, even a few tablespoons diluted in juice may be wise. To make ginger beer, grate and juice a small knob of ginger and add this to the second ferment. A squeeze of lemon and a sprig of fresh mint make lovely additions. Water kefir grains can be added directly to fruit juice to make a less-sweet, probiotic fizzy drink (win-win!). My absolute favourite is grape juice kefir which makes an outstanding sparkling grape juice. But be warned, it can get very bubbly! Use your plain or flavoured kefir to dilute fruit juice, green juices, or use it to make slushies. Kefir can also be used as a starter culture for other ferments. For more ideas, check out this great list, not to mention my own Pinterest collection.